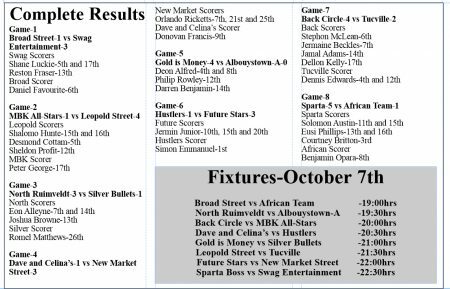 Sparta Boss, Future Stars, Back Circle, North Ruimveldt and Gold is Money all scored convincing group stage wins when the inaugural Street Vibes Entertainment, Futsal Championships continued Thursday at the National Gymnasium on Mandela Avenue. Sparta Boss made light work of the African Team with a 5-1 rout with Solomon Austin bagging a double in the 11th and 15th minute while Eusi Phillips netted twice in the 13th and 16th minute. Adding to the score in the third minute was Courtney Britton. For the Africa Team, Benjamin Opara netted in the eighth minute. In another fixture Future Stars downed Hustlers 3-1 with Jermin Junior netting a hat-trick in the 10th, 15th and 20th minute. Simon Emmanuel netted for Hustlers in the first minute. Dwayne Lindie (no.11) of MBK All-Stars attempting to thread a pass between Leopold Street’s Samuel Hunte (2nd from left) and Omallo Williams to teammate Kevon Lythcott (left) during their group clash at the National Gymnasium in the Street Vybes Entertainment Futsal Championships. Back Circle eliminated Tucville 4-2 with goals from Stephon McLean, Jermaine Beckles, Jamal Adams and Dellon Kelly who netted in the sixth, seventh, 14th and 17th minute respectively. Tucville’s goals came off the boot of Dennis Edwards who scored in the fourth and 12th minute. North Ruimveldt whipped Silver Bullets 3-1. Eon Alleyne recorded a double in the seventh and 14th minute while Joshua Browne scored in the 13th minute. For the Lindeners, Romel Matthews was on target in the 26th minute. Also, Gold is Money blanked Albouystown-A 4-0. Deon Alfred registered a double in the fourth and eighth minute while Phillip Rowley and Darren Benjamin netted in the 12th and 14th minute apiece. 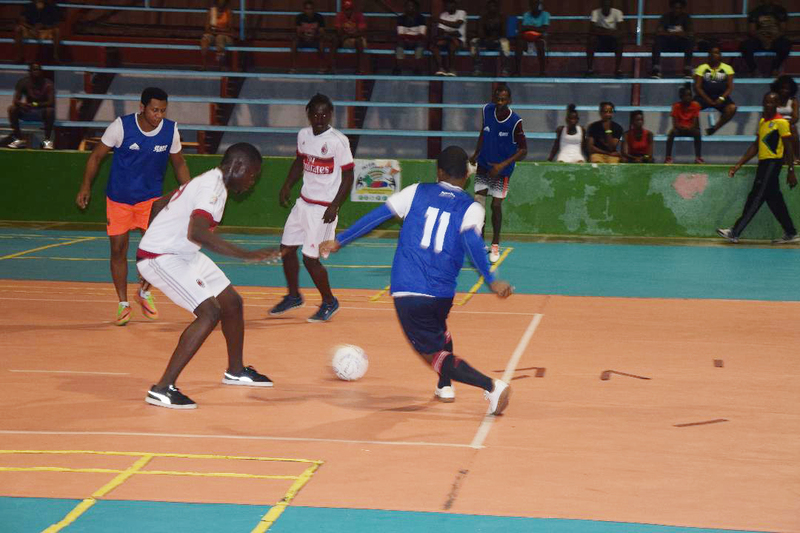 Meanwhile, Leopold Street humbled Meadowbrook Kings (MBK) All-Stars 4-1. Shalomo Hunte bagged a double in the 15th and 16th minute, while Desmond Cottam and Sheldon Profit scored in the fifth and 12th minute. For MBK All-Stars, Peter George scored in the 17th minute. New Market Street dismissed Dave and Celina’s All-Stars 3-1 compliments of an Orlando Ricketts hat-trick in the seventh, 21st and 25th minute. For Dave and Celina’s, Donovan Francis found the back of the net in the ninth minute. In other result, Swag Entertainment upset Broad Street 3-1. Shane Luckie netted twice in the fifth and 17th minute, while Reston Fraser scored in the 13th minute. For Broad Street, Daniel Favourite was on target in the sixth minute. The tournament resumes today at the same venue with another round of group matches.